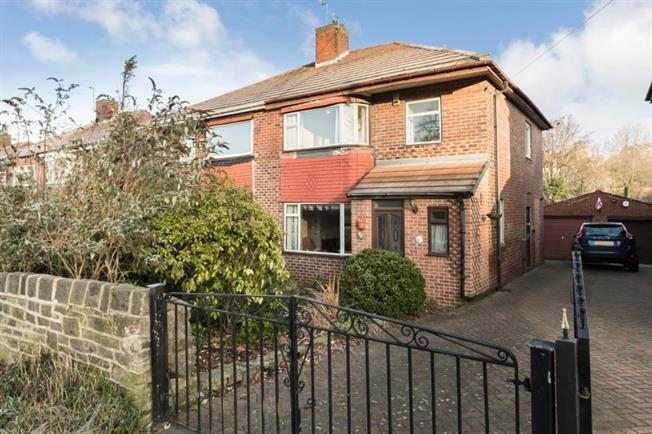 3 Bedroom Semi Detached House For Sale in Sheffield for £110,000. An excellent opportunity to acquire with no chain this three bedroomed semi detached home, offering lots of potential requiring a general scheme of modernisation. With accommodation over two levels and the benefit of gas central heating, front and extensive rear gardens and garage. Ideally located for the full range of local amenities including local shops and supermarkets, schooling, public transport links, access to the Northern General Hospital, further amenities in nearby Hillsborough include leisure centre, park, library and shopping centre. the accommodation comprises an entrance hallway with stairs to first floor landing, bay windowed lounge to the front, dining room to the rear with patio doors to the rear garden. kitchen with a range of base and wall units and side access door. On the first floor, double bedroom one has bay window to the front, double bedroom two has rear window with aspect over the garden, bedroom three offers flexible accommodation as further bedroom, study or nursery. The bathroom has three piece suite including WC, wash basin and corner bath with shower over. To the exterior is a garden to the front, block paved shared driveway leads to the brick built semi detached garage having useful workshop to the rear. The extensive rear gardens have a patio area providing excellent outdoor seating and entertaining area with lots of potential for keen gardener or play areas. An early viewing is essential to appreciate the full potential on offer.